Learn another language the way you learnt your own. You learnt your own language naturally and enjoyably: now you can learn Dutch in the same way. What is the Michel Thomas Method? The Michel Thomas Method teaches everyday conversational language that will allow you to communicate in a wide variety of situations, empowered by the ability to create your own sentences and use the language instinctively, having absorbed the vocabulary and grammatical structures. These all-audio courses were perfected over 25 years by gifted linguist and teacher Michel Thomas, and provide an accelerated method for language learning that is truly revolutionary.Lessons 1-8, the Beginner course: This course makes no assumption of knowledge of any language other than English and gives the beginner practical and functional use of the spoken language. It is also appropriate for anyone who has studied Dutch before, but has forgotten much of it or does not have confidence in speaking. 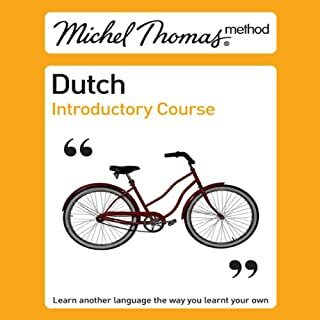 The Beginner course is designed to take you from complete beginner to intermediate level.Lessons 9-12, the Intermediate course: This course is for those with an intermediate-level foundation in Dutch, or those who have completed lessons 1-8 and want to take their learning to an advanced level and speak Dutch proficiently and easily. How does it work?Unlike most language courses that focus around topics or grammar forms, the Michel Thomas Method works by breaking a language down into its component parts, enabling you to reconstruct the language yourself - to form your own sentences, to say what you want, when you want. Within the first 10 minutes of the course, you will be generating complete sentences on your own. It is important that you complete the lessons in order. The Method is successful because it builds on the language you learn in each lesson and 'recycles' language taught in earlier lessons, allowing you to build ever-more complicated sentences. Because the Method is based on understanding, not memorisation, there is no set limit to the length of time that you should study each lesson. Once you feel you have a good grasp of the language taught in one lesson, you can move on to the next. In lesson 3 of the Dutch Beginner course, you’ll be able to give commands and use the Dutch 'even' to soften requests with…- social communications: 'Good afternoon', 'please'- adverbs and adjectives: 'already', 'just', 'dear' (sense 'expensive'), 'ready' (sense 'finished')- expressing the future with 'go': 'I'm going to do it tomorrow'- pronouns and nouns: 'you' (plural, = 'you all'), 'you' (formal), 'us', 'everything', 'way'- verb forms for 'you': 'jullie' (plural, = 'you all'), 'u' (formal), 'je' (informal)- prepositions: 'to' (sense 'to a place'), 'towards', 'with'- verbs: 'to be able' ('can'), 'to wait', 'to buy'- giving orders- use of Dutch 'even' ('just a minute', etc. ): softens a request- place expressions: 'inside', 'away'In the next lesson you’ll learn about Dutch stressed pronouns and words that send the first verb to the end of the sentence (the 'omdat' effect) and be able to say that you like doing something using 'graag'. 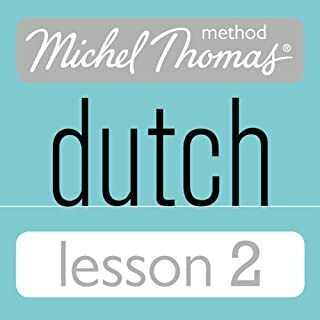 The Michel Thomas method for learning a language is fantastically easy- almost to the point of effortless. I am studying Dutch and I feel very comfortable and capable when using it with co-workers from the Netherlands. I cannot recommend this series highly enough and would suggest choosing one of the free 20 minute introductory lessons to hear and try for yourself.